The last rushing attempts for Adrian Peterson in the preseason came in 2011. That doesn't figure to change for the Vikings star this month, either. 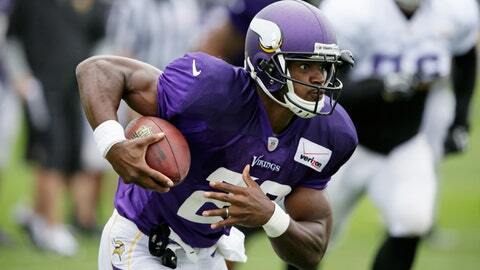 MANKATO, Minn. — Adrian Peterson hasn’t taken a preseason carry the past two seasons. New Minnesota Vikings coach Mike Zimmer is keeping the trend going, at least for Friday’s preseason opener. Zimmer said Peterson won’t play when Minnesota begins the preseason at home against the Oakland Raiders. The Vikings will be opening their first full year playing at TCF Bank Stadium while the team’s new $1 billion facility is built on the footprint of the old Metrodome. Zimmer said the rest of the team’s starters will see action, but it won’t include the star running back. 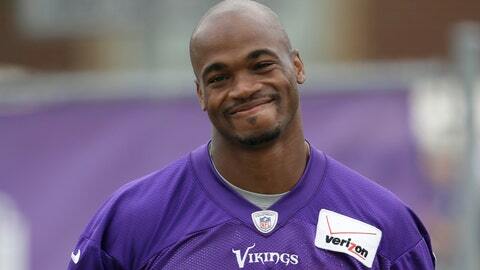 Peterson didn’t have any carries in 2012 as he returned from major knee surgery. He went on to win the NFL MVP award with the second-most single-season rushing yards in NFL history. Former coach Leslie Frazier also took it easy with Peterson last year. Peterson appeared in one game, but didn’t have a carry in a brief showing in the third preseason game. The last carries for Peterson in the preseason came in 2011 when he played in three of the games and had 21 total carries. "It’s exciting because the season’s starting to kick off," Peterson said Tuesday. "It’ll be good to see the young guys out there in some live situations." Peterson wouldn’t mind seeing some action in the preseason, however, as he adjusts to the new offensive system being installed by coordinator Norv Turner. "It all depends on how I’m feeling," Peterson said. "I haven’t played a preseason game in two or three years, so we’ll see. With the new offense, I might want to go out there and get a few plays in, but I’ll sit down with Zimmer and see what he thinks." Zimmer did say rookie quarterback Teddy Bridgewater would play "a good amount" in Friday’s preseason game. Earlier in the day, Turner said he’d like to see Bridgewater work with the first-team offensive line in a game. Robinson sits out practice again: After returning to padded practice on Monday, cornerback Josh Robinson sat out Tuesday’s practice and worked with trainers on the side. Robinson has been dealing with a hamstring injury. "He’s real close," Zimmer said after practice. "Those corners are hamstring guys. We’re trying to just be a little careful with him. That’s all." Safety Robert Blanton, who’s been out the past week with a hamstring injury, could be getting closer to a return. 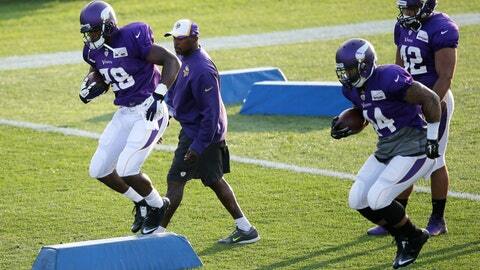 "I heard the prognosis is a little bit better than I heard before, so I’m hoping so," Zimmer said. Blanton was listed as a first-team safety on the first depth chart released by the team on Tuesday. Zimmer said he needs to see Blanton return and earn the spot. Minnesota has also used Jamarca Sanford, Kurt Coleman, Mistral Raymond and Antone Exum in the spot next to Harrison Smith. "Well, Blanton needs to get back out here. He was doing good early and now he’s got to get back out and show what he can do. And Sanford was hurt at the beginning, so it’s all about them. They’ve got to prove to me out here what they’re going to do." Chris Crocker was signed on Monday and has played the past seven seasons for Zimmer in Atlanta and Cincinnati. He received some time with the first-team defense on Tuesday. "I think it’s helping," Zimmer said of Crocker knowing the defense and being able to step in immediately. "But part of that is helping show these other guys where they’re at. I don’t know who’s going to be the starter, to be honest with you. I have no idea."